IS BMI (BODY MASS INDEX) MISLEADING? At first BMI was used in studies of population health, but soon became adopted by doctors who wanted a quick and easy way to measure body fat in their patients. By 1985 the National Institute of Health (NHI) began defining obesity according to body mass index. The initial thresholds were 27.8 for men and 27.3 for women - as healthy weights. These new numbers caught on amongst researchers who now had a cheaper and faster measure of body fat.Then in 1998 the NHI consolidated the thresholds for man and women and added the category of overweight. The new, radically lowered thresholds were now 25+ for overweight and 30+ for obesity! Its worth noting that many who were on the "independent" board making recommendations had ties to the commercial weight loss industry - so more people considered overweight or obese might be beneficial. So,with this chequered history,why might it be dangerous to regard a BMI reading as a good indicator of health? ​1. It is scientifically weak. There is no physiological reason to square a persons height - Quetelet squared the height to get a formula that matched overall data - if the data doesn't fit, change the formula! Moreover, it ignored waist size, which is a clearer indicator of obesity levels. ​2. It is physiologically flawed. It makes no allowance for the relative proportions of bone, muscle and fat in the body. Bone is denser than muscle and twice as dense as fat, so a person with strong bones, good muscle tone and low fat could have a high BMI. Thus, athletes who work out a lot could find themselves classified as overweight or even obese. 3. it suggests there are distinct categories of underweight, ideal, overweight and obese with strict cutoffs that hinge on decimal points - REALLY!! 4. More cynical members of society might suspect that the medical insurance industry lobbies for the continued use of BMI to keep business flourishing! 5. Reliance on BMI means doctors do not feel the need to use one of the more scientifically sound methods that are available to measure obesity levels. These alternatives cost a bit more but give far more reliable results. ​If not BMI what then? Obesity puts you at elevated risk for many chronic diseases. One of the simplest ways of measuring body fatness is calculating your waist-to-hip ratio, a relationship between your waist circumference and hip circumference. You can easily do this at home. The lower your waist-to-hip ratio is, the better. If you have a wider-at-the-waist, apple-shaped body you're likely to be more prone to health problems than a wider-at-the-hips, pear-shaped person, according to the University of Maryland Medical System. 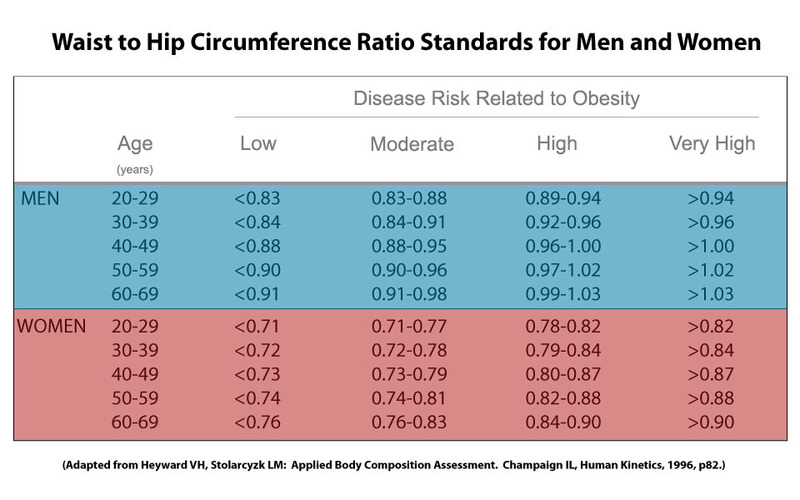 Women with a waist-to-hip ratio of 0.8 or less, or men with a ratio of 0.9 or less, are considered "safe." A WHR of 1.0 or higher, for either gender, is considered "at risk" for overweight-associated health problems. Waist circumference is an important indicator of health because the fat surrounding the abdominal organs is metabolically active, meaning that releases fatty acids, inflammatory agents, and hormones that affect cholesterol, blood glucose, and blood pressure. With more abdominal fat comes a higher risk of metabolic abnormalities, and thus a higher risk of chronic disease. To calculate your WHR divide the waist measurement by the hip measurement. Waist to Hip Ratio (WHR) is a much more accurate way to determine the kinds of body fat that might pose health risks. And WHR is just as easy to record as BMI.